When you are looking to set up an aquarium, whether at the office or at home, you want to make sure it is a painless process. Sometimes you might not know all the important accessories that you need for the process, this is why you need to get the best aquarium kit. Many kits are available today each containing different types of accessories that might come in handy for having a functional aquarium. So, which would be the best model to choose? We get to look at some of the best 20-gallon fish tank kits below. 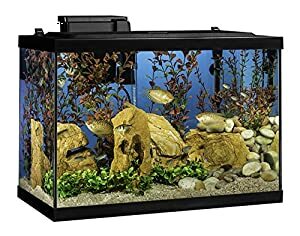 What is the Best 20 Gallon Fish Tank Kit? Tetra 20 Gallon Complete Aquarium Kit Glass Aquarium, LED Hood, Heater, Filter, Boxwood Plant Mat, Artificial Plants. Starting with the design, the manufacturer made it be simple with nothing extravagant about it. It is a simple rectangular shape which should make it great for home or office environments. The relatively small volume helps with saving on space. With more space saved, the design will easily blend into the office décor so that it does not seem too obtrusive. The kit features a captivating light that should make using it feel great. It will bring more color into the room when turned on as compared some other models in the same industry. The bulb used is not too bright that it ends up disrupting the normal life of the fish. The bulb is still energy efficient so that you do not have to worry about spending more on the energy bills when you have this kit installed. Since filtration is important for keeping the tank water clean, you should have no trouble at all when it comes to this kit. It comes with all the necessary filters. The installation of the filter is simple as it is made to be a simple clip-on filter. You also get to change the filter cartridges with ease when you choose this model. They can be switched whenever the maintenance is due. This filter further promotes biological filtration so that the water still remains safe for your fish. The removal of toxic ammonia and other pollutants should leave you with the best clean water that you have always wanted. You will need to have the right type of fish food to ensure that the fish in the aquarium stays healthy. The kit comes with Fluval Max fish food to get you started. If you had no idea which food would be the best for the fish, you can always start with this one. There is also the water conditioner supplied with the kit important for making the tap water safe for your fish. This is the kind of kit that you could use as a starter kit or give someone as a gift to help him realize the dream of owning an aquarium tank at some point. The model comes with various features and benefits that will make being an aquarist a great experience. As for the material, this kit comes made of glass and has a rectangular shape. The glass material should easily help promote better clarity with the water in the tank. Other materials might become cloudy with time. The model still features a canopy on the hood to help with feeding the fish quite easily. Well, on the overall you should find that the kit looks great aesthetically once it is put together. The filtration process is going to be a major concern for most people. They always want to make sure that they have a filter that will keep the tank water clean at all times. You are in luck with this kit as it comes with a 20-gallon fish tank filter. The filter is designed to be a 5-stage filter so that all the contaminants are removed at the end of the process. If the water was once cloudy due to dirt and contamination, the filter will remove any discoloration and odor leaving you with clean water once again. The third stage of the filter involves a bio-holster. This is important for removing the nitrates and ammonia. In the end, you should have clean water returning to the tank after more oxygen has been added to it in the last stage. Lighting is often seen as the crowning factor when looking to get the best aquarium kit. You get the LED lights fixed in the canopy to provide the right light for the aquarium. The lights provide medium brightness which is enough for the fish. The fish will always have a comfortable environment for swimming. As for the setup process, you should have an easy time assembling the kit and get it working in no time. The manufacturer provides you with detailed instructions on how to get it done in no time. You can always check out some YouTube videos to see how other people might have assembled it. Some of the things you get with the kit include a setup guide, premium fish food, a fish net, a thermometer, a water conditioner, and a water heater. Coming from a top brand, this model has managed to be one of the most popular kits you can get today. The complete kit helps you achieve the best performance that you have always wanted from an aquarium. The manufacturer clearly understands what you need as it comes with all the important parts you need to set up a complete aquarium. For those who are new to keeping fish, you can now have to use the best tools for your aquarium. Most people tend to have a problem when it comes to picking the best individual components for the aquarium, but the kit now comes with everything. Some of the things you will get with the kit include a hood integrated with LED lights, water filter, artificial plant for decoration, and plant mat. As you can see, you should be ready to set it up within just a few steps. The use of the LED lighting is important for decoration. Having a proper light setup will always help further by making sure you have the best looking aquarium in the living room or office. The light bulbs being LED will last for longer as compared to the other types of bulbs. They provide also the right wavelength which is safe for your fish in the aquarium. There is also the inclusion of a water heater and filter in this kit. These two are important for making sure the environment for your fish remains proper. The water filter is important for the water filtration and leaving you with clean water to keep the fish. The type of filter found in the kit is designed to be easy for setting up. The same goes for the maintenance part. You can easily change the cartridges to ensure that the filtration goes on properly all the time. The water heater is great to ensure that the water is maintained at the right temperature important for the survival of the fish. As part of making sure that the aquarium looks its best, you get the artificial plant and floor mat as part of the kit. The artificial plant resembles a water plant in the sea or river. This should make decoration better in all aspects. Some people might think it is part of the real water plants when it is just a decoration. There is no doubt that you are going to like this type of kit once you have fully set it up. The kit features a unique half-moon shape which offers something new as opposed to some of the common shapes you get with the other models. By the time you set up this type of kit, you should be happy with what you get to see. The featured LED light further makes you enjoy the display you get with the model. It will help to get you a natural shimmering effect in the water. Being LED light, it is therefore energy efficient and it is still powered by a low voltage adapter. Everything about it involves saving more energy. The manufacturer had to include a clear canopy integrated with a hole that should make feeding the fish easier and faster. The design also gives you provision for mounting the filter in position. The filter is not included in the kit, but you can get one cheaply. With the filter mounted, you are always sure that the water is maintained clean to provide the best environment for the fish to stay healthy. The use of the canopies is important to help the reduction of water evaporation from the tank. You will not have to keep on refilling the tank to maintain the water level. The half-moon shape is quite important when it comes to the having a great view. Many people love the 180-degree seamless view they get with this kind of design. With a strong plastic being part of the construction, the tank is going to last for longer so that you do not have to worry about using a new kit anytime soon. Back to the LED lights, you get different types of lighting with this kit. You have 42 White LEDs and 3 Blue LED lights. You can choose the type of color depending on the type of the day. The daylight LEDs will help create the shimmering light. This light will mimic the underwater effect of the sunlight. You still get the nightlight LEDs that a low for nighttime enjoyment of your aquarium. Coming from a top brand, there is no doubt you will be comfortable with getting this type of model. 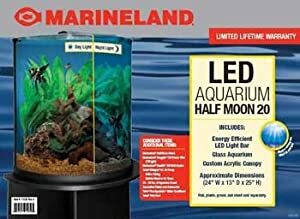 Marineland has been making the best aquarium accessories that should make this one earn its reputation easily. With its unique design, you should have most of your friends asking you where to get a similar model. This could be the perfect chance for you to end up with the best-looking office on the block with the aquarium included in it. With this kit, you should have your aquarium setup in no time. It comes with multiple accessories important for getting your aquarium up and running in the less time possible. The setup process is simple and can be done in a few minutes. Make sure to fill the tank with water and food then proceed to add the fish in the tank. We all know how the fish can leave ammonia-rich waste in the aquarium and eating the food. The ammonia is further broken into nitrates due to the bacteria present in the water. You have to get the medium plant installed in the water to help with filtering it. The manufacturer needs the user to have the plants in the tank as they get to use the nitrates for their growth. The maintenance part is simple. You will have to perform a few maintenance processes as instructed by the manufacturer. You have to make sure that you always get to do it right all the time to make sure that the aquarium remains clean and looking great. It will take you a few minutes so there is no reason why you should not do it. As part of making sure that the kit works great and delivers on better performance, the model features a 24” electric fixture. This is important for making sure there is enough light needed for photosynthesis. With proper light delivered to the light, then you should have the proper growth of the plants and still get to light up the aquarium. Another useful feature is the sterilizer included in the model. The kit has a sterilizer is great as it means you get to remove the harmful bacteria from the tank with so much ease. You also get to maintain the feeling level for the fish. This feature also reminds you if you tend to over flood the tank with new fish. Well, there is so much to love about this kit. First, it comes with a great design that also looks straightforward and innovative. The filter included in the kit is durable thus no need to have it replaced anytime soon. The filter is still strong so that it can deliver a better flow rate as compared to what you get from other models. A number of options exist when it comes to buying the best aquarium kit. You need to take the time to ensure you pick the right model. 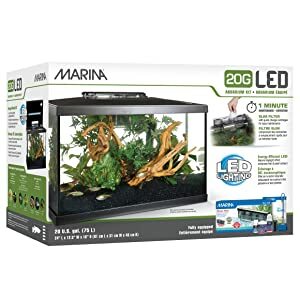 Well, from our list, the Marina LED Aquarium Kit seems as the best you can get today. It is a model that delivers on such functionality that you might have always been looking for. It comes equipped with everything needed to make the novice fish hobbyist’s first venture into the wonderful world of fish-keeping an easy and enjoyable experience. The first thing you have to consider when choosing the aquarium kit should be the best based on the different features that it has to offer. Look at the number of accessories that come with the kit. These accessories should be the important type as you want a functional aquarium by the time you get to set up the aquarium. There is no doubt that the filtration equipment is going to be important too. You want a model that features a great filtration process so that you can have a clean environment for your fish. Any additional accessory that would help keep the water clean you should consider having it. The design of the final setup could be also another important feature you get to consider. Make sure that you pick a model that would add a great look to your room whenever you have it set up. It is the reason for checking out more reviews about the design and functionality is important. The lights are also important for an aquarium kit. Make sure that the kit comes with LED lights. The LED lights are known to be great when it comes to the performance and energy conservation. The lights can be important if you have plants in the aquarium that need the light for photosynthesis and better growth. Once you have the aquarium kit, setting it up should not be hard compared to when you have to buy different parts from various brands. The first thing you have to do when it comes to the setup should be reading the manufacturer’s instructions. This is important so that you understand what you are working with when it comes to setting it up. Most manufacturers would have a detailed description of the process of setting it up. Some would go further to show you the steps in diagrams so that you know exactly where to connect each part. Depending on the model, you should be done with the setup in no time. You can always check out video platforms such as YouTube to see how other people have set up a similar model. 20 Gallon Fish Tank Setup!!! If you had trouble before choosing the best aquarium kit, now you know a few places where to start. All the models we have reviewed above are the best you can get on the market today. You can now set up a great aquarium in no time with these kits. The best part is that you can get some of them being affordable in the long run as compared to buying the accessories separately. 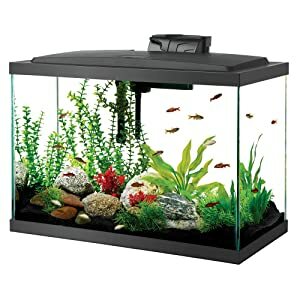 Best 10 Gallon Fish Tanks Available Today?